Choose one suitable for your needs & choose from 100's of Henna friendly designs. 2 LG. LAMINATED Design Books (made in 3 ring folders) HIGHLY RECOMMENDED!! This is the ULTIMATE OPTION to preserve your "Modern Design Books" - in the past I've gone through at least 2 sets of Design Books/Folders a season working outdoors, until finally I smartened up and Laminated my books, I recommend you have this option applied - especailly if you plan on working outdoors, remember that eventually you WILL get stuck in rain (or hail!) and you'll wish like heck you had protected books, This option also allows your designs to be made on "High Quality Heavy Stock Paper" and formatted into a Three Ring Folder. This is a must! A great "Hand/Home Made Soft Cover Henna Tattoo Design Book" I put together containing Color Photo Samples and Hundreds of Designs in Black/White. This book has 44 pages containing over 300 designs which include; Suns, Tribal Arm Bands, Tribal Patterns, Flowers, Chinese Characters, Geckos, Turtles, Frogs, Butterflies, Moons, Letters and much much more. Md. LAMINATED Design Book (made in 3 ring folder) HIGHLY RECOMMENDED!! This is the ULTIMATE OPTION to preserve your "Modern Design Book" - in the past I've gone through at least 2 sets of Design Books/Folders a season working outdoors, until finally I smartened up and Laminated my books, I recommend you have this option applied - especailly if you plan on working outdoors, remember that eventually you WILL get stuck in rain (or hail!) and you'll wish like heck you had protected books, This option also allows your designs to be made on "High Quality Heavy Stock Paper" and formatted into a Three Ring Folder. This is just a smaller version of what's above, again it's a "Hand/Home Made Soft Cover Modern Henna Tattoo Design Book" which contains Color Photo Samples and Designs in Black/White. This particular book has 34 pages of over 200 designs which include; Suns, Tribal Arm Bands, Flowers, Astrological Signs, Chinese/Arabic Characters, & a mixture of Geckos, Turtles, Frogs, Butterflies, Moons and more. Sm. LAMINATED Design Book (made in a 3 ring folder) HIGHLY RECOMMENDED!! For someone looking for a tiny version of what's above this should do. 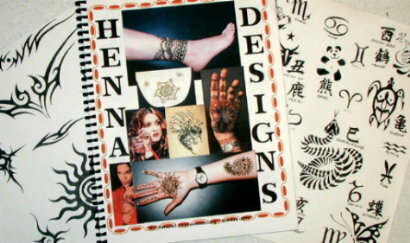 This "Hand/Home Made Soft Cover Henna Tattoo Design Book" again contains Color Photo Samples and Designs in Black/White. The book has 22 pages of over 100 designs which include; Suns, Tribal Arm Bands, Flowers, Astrological Signs, Chinese/Arabic Characters, & a mixture of Geckos, Turtles, Frogs, Butterflies, Moons and much much more. This CD/ROM contains OVER 1,000 Kanji Symbols and Designs. This instant library of Kanji on a single CD/ROM is GREAT for TATTOOS & BODY ART!!! Also has the English translations so you know what you are looking at instead of having to reference! Over 1,000 Individual Kanji Art Symbols & Designs on CD/ROM!